The demand for clean drinking water is reaching an all time high due to increasing instances of both water and air/water pollution around the world. Years ago rain water was pure enough to drink and snow clean enough to eat, but these days no untreated water is safe for consumption. The RainMaker from Advanced Dryer Systems, Inc. utilizes the most natural method of distillation available. Much like rain, the air to water distillation system captures H2O in gaseous form in air before it has a chance to pick-up many of the contaminants and particulates present on the surface of the Earth. In taking advantage of this process, the large amount of energy required by man-made distillers is in this instance provided freely by nature. The RainMaker's purpose is then to complete the cycle by capturing air laden with moisture using Dinh™ patented water extracting heat pipe/evaporator combination coil technology. 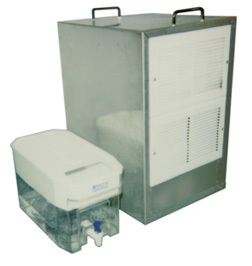 The RainMaker may be used as an ultra pure source of drinking water, whether it be in a public environment or at home. The RainMaker may be used as a practical replacement for expensive bottled water or other energy intensive distillation units. The RainMaker can run on approximately half the energy of the conventional distillers and needs much less maintenance. One extra benefit of the unit is a decrease in humidity of the surrounding area since the moisture has been taken from the air to produce water; the result is an area that is more comfortable for humans and better for furniture and machines.